Country Estate Creamer - Delft - 4"H - 10 Oz. Country Estate Lidded Sugar/Jam Bowl Main House - Delft - 8 Oz. Super cute. Love this for registries and anyone who has a relaxed, classic or rustic home. The softly polished and skillfully handcrafted Classic Cream and Sugar Set is a practical, gracious addition to any dining table or serving tray. Stoneware. The rustic yet chic shape of the sugar looks clean and sophisticated on your table. Handformed in Tuscany of Italian stoneware. Microwave, oven, freezer, and dishwasher safe. 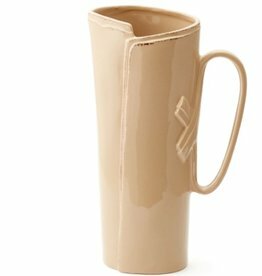 Embody the qualities of the Italian home with the warm, casual elegance of the Lastra Cappuccino Tavern Pitcher. This unique pitcher is ideal for hosting a bouquet of flowers or simply a beautiful display on your buffet. Super cute! A unique yet practical gift, the farmhouse style Woodbury Creamer and Sugar Bowl Set is sure to become an everyday essential. How perfect for today’s casual farm house style! A great lightweight and durable classic. We love this tea pot and can see it in a cozy cottage, seaside, or anywhere. 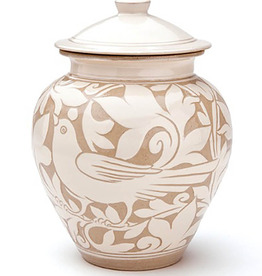 This sugar bowl features two tailored black bands topped with white "stitching." Accented with precious platinum. This elegant Vietri Incanto Footed Pitcher with Lid was inspired by the maestro artisans' family dinnerware heirlooms of many generations and the best art and architecture of his famous country. The lid on this pitcher is perfect for hot and cold drinks. From Juliska's Amalia Collection - this sparkling vessel is accented with a simple swirl to lend a chic touch to the breakfast table or teatime. Stoneware. The rustic yet chic shape of the creamer looks clean and sophisticated on your table. Handformed in Tuscany of Italian stoneware. Microwave, oven, freezer, and dishwasher safe. 7 Oz. Lastra Creamer - Aqua - 7 Oz. 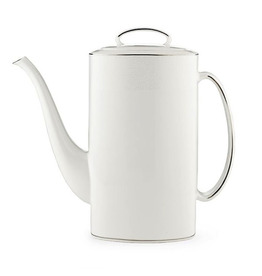 Serve coffee with the elegant china kate spade new york Cypress Point Coffeepot featuring the cobblestone detail and platinum accents of the matching dinnerware. 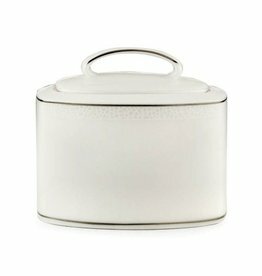 The contemporary and chic styled kate spade new york Cypress Point Sugar Bowl. Like a cobblestone path, the Cypress Point dinnerware motif encircles this serving piece. A classic creamer, also great for sauces. Double black bands, topped with white "stitching," encircle the top of the creamer. Platinum accents complete the sophisticated look. Kate Spade Union Street Creamer - Platinum - 3.5"H - 12 Oz.